Mokuru is the latest desktop toy to hit our shores and consists of a 9cm wooden cylindrical shaped piece with rubberised end pieces. The idea is that you flick it from side to side and it will bounce across the floor multiple times as well as it’s ability to spin around so I can see how it can easily become an addictive finger toy that can keep you occupied for hours. Available in seven bold colours, we received the red one to try out. On first viewing it seems like a simple toy and you wonder how it’s going to perform but once you try giving it a roll, it’s really interesting how you can balance it and flick it from end to end. My 9yr old daughter was fascinated with it and spent much time in the hallway on the floor trying to fathom it out. We found Mokuru to be a fun in that it can either be played on your own or with others, flicking it across the table to each other was a preferred one ( I can see this being popular for kids in restaurants passing the time whilst waiting for their food!). A hard surface is a must so either a table, hard floor, desk, windowsill – you name it, there is always somewhere you can find to flick it around! Mokuru is definitely the next must have craze to hit the UK after the fidget spinner and will be sure to have kids and adults up and down the country competing to see how many times they can flick the toy across the floor! Air Wars Battle Drones from MGA Entertainment are an exciting pair of durable drones aimed at ages 8+, that are ready to battle it out between each other. With two drones and two remote controls in the box, it’s perfect for a bit of healthy competition with friends and family or you can just practice with one of the drones yourself as they do take a while to get used to and be able to control successfully. There is one red and one grey drone in the box, the same with the controllers. These have to be paired up together and we tended to pair matching colours to help us know who had which one. The remote controls require 3AAA batteries each which are included. The drones have a rechargeable pack in them that is simply charged through a micro usb cable. Each drone has 4 propellers and the set also comes with 8 spares. There are also 10 weapons in various shapes that you can hook on to the edge to help destroy your opponents drone whilst having a battle. These are simple to hook on the edges and help to bring the other one down. The remote control is simple to use with three speed settings and four preset buttons to carry out various attacks with just one press of the button. These help you to carry out a special move quickly and easily. You then have regular controls to move around. It definitely takes a bit of getting used to and I’d recommend you start on the slowest setting until you get used to controlling them. The more you try, the easier it is and as you get the hang of how sensitive it is they become more manageable. So what did we think of the Air Wars Battle Drones? They were incredibly fun and exciting for all the family. We had all ages in the room from 5 to 68 and everyone was eagerly watching the drones zoom around the room, wondering where they would go next and if they’d get into battle with each other. The atmosphere was great and everyone’s eyes where glued to the drones at all times. My almost 9yr old daughter enjoyed controlling them along with various adults. This is a fabulous toy set although does require space so a large room or outdoors is best. I think these would make an awesome Christmas present and provide hours of fun for everyone. They are quick to set up and don’t take long to charge so the battle can commence almost straight away. Why not check them out now? Schleich is a well known established brand that builds toys to last so we were excited to check out the Pick Up with Horse Box playset. A fun set containing a pick up truck, horse box and a number of accessories, there is sure to be some imaginative play from this set. Included to go along side the pick up truck and horse box is a horse, 2 figures (one is a driver), saddle, bridle, horse coat, bale of hay, bunch of carrots, 2 grooming brushes. The horse box requires some minimal assembly and also the sheet of stickers needs to be carefully applied. I did this myself to ensure they were neatly placed whilst the children helped put the box together. After a few minutes we had our complete playset and I have to say at first glance you can see the quality. It definitely stands out amongst other toys, the plastic is solid, the parts are sturdy and you know this will withstand years of play. The pick up is a dark pink with a great space in the back to put the accessories during play. The doors also open and there is a driver figure who is fixed in a position to sit on the front seat. The bonnet also opens so you can see the engine. The horse box is well thought out allowing the top half to come off to gain access to play inside. The back folds down to create a walkway for the horses to get up and there is a divider inside allowing two horses to be placed inside. Each front corner of the horse box reveals an opening door, on one side for the groom to get in and out, and on the other is a cupboard for storing the bridle equipment. The horse has a lovely bundle of accessories that really do keep children entertained. Although my daughter was first to play with this, it was my little boy who really let his imagination go as he played for the whole afternoon with just this toy. The horse went on all sorts of adventures and he particularly liked putting the horses coat on and off and grooming it with the brushes. I think this is are really lovely playset by Schleich and lives up to all of their high standards. We do have a set of Schleich horses which we have now integrated into play with this, along with my little boys tractors and other farm sets which he loves creating a whole play scene with and taking his animals on adventures. A fabulous playset that leads to lots of imaginative play for little ones and retails at £39.99. To see the full collection check out Schleich. When Addict A Ball arrived at our door I knew it’d have us all fascinated, frustrated and intrigued for hours, and it hasn’t disappointed. With the name Addict, it certainly lives up to this and all the family have tried for hours to complete and although we can get further all the time, the end still defies us. The game is enclosed within a giant plastic ball and consists of a maze which goes every way imaginable. There is a small silver ball which you have to get from one end to the other. The maze is marked with numbers along the way which you have to follow and it guides you through. There are three starting points, so if you keep getting stuck at a certain point, you don’t have to go right back to the beginning, you can step in at the second or third starting points. To get through involves a lot of twisting and turning to balance the ball along it’s path and just a slight wobble can make the ball fall off of it’s track. The game is aimed at all ages and both my 8yr old daughter as well as us adults have all spent much time playing with this. It’s one of those things where you are determined to get further than the last person and the challenge keeps you motivated to keep trying and trying again until you succeed. The plastic around the ball has a slight flexibility to it, to prevent it from cracking if it has dropped so it is very durable. This game has widespread appeal and is something you keep coming back to in order to out do your previous attempt. I imagine this would make a wonderful Christmas present for any family who like a challenge and being suitable for all ages means this is a very versatile gift! The Orginal Stretch Armstrong is an iconic child’s toy from the 1970’s that has been brought back to life for children of today. The toy can be pulled and stretched in all sorts of ways up to 4 times it’s original size. You can even tie his arms and legs into knots and twist him up, knowing that he will always revert back to his original form afterwards. The doll itself is 30cm tall and he looks rather chunky. The first thing I noticed when I removed him from the box is how heavy he is, more so than I was expecting. He also feels rather strange, with soft maleable limbs that almost feel like rubbery putty. The children were intrigued and couldn’t wait to try him out. He’s initially quite tough to stretch, but once you know what you are up against you know to give him a good hard pull and his limbs extend. I was amazed how tall and skinny he got but as soon as you let go, he just pings back into shape. Here’s daddy and Miss M seeing how tall and skinny they can make him. Once they got started they couldn’t stop and had fun contorting poor Stretch Armstrong into all sorts of poses. It became a bit of a challenge to see what they could do next with him. Finally they wrapped him all up and he stayed in position without any assistance, but as soon as you start unwrapping his limbs they full straight back into shape. The toy proved to be fun and certainly very different from other toys we’ve tried so was captured the children’s imagination as to what we could do with him. If you fancy trying out The Original Stretch Armstrong, he can be purchased from Character Online. If you are a fan of Zelfs then the series 6th range of figures including a Limited Edition figures are available in stores from the end of July 2016. With Mary Go-Round, a carousel pony Zelf being the rarest limited edition Zelf yet, there are just 400 available to claim within the UK! Mary Go-Round being a carousel pony is rather glamourous and prettily adorned. She comes with a few accesories to style her hair, a comb and three hair elastics. There is also a sparkly horseshoe shaped charm for you to use how you wish. Because this is a limited edition you get a special token printed with your limited edition number on it alongside a collectors leaflet showing you the whole range of Zelfs. The figure can be played with in many ways with a turning head and as well as the normal Zelf hairstyle, the carousel pony has a tail that falls in beautiful curls. The hair feels super soft and Miss M sat stroking it for ages before attempting a ponytail with one of the bands. With it being so smooth, it also stays tangle free which is a bonus. Some other cute looking Zelfs to look out for in Series 6 Crystal Zelf range are Cupie, High Tail, Magicella, Miss Terri, Noodles and Shimma. Zelfs fans can also join the Zelfs club www.zelfsclub.co.uk for more competitions and Zelfs news! Chicago Town pizzas are regularly eaten in this house, my children love The Deep Dish and I find The Sub handy for a lunchtime treat. 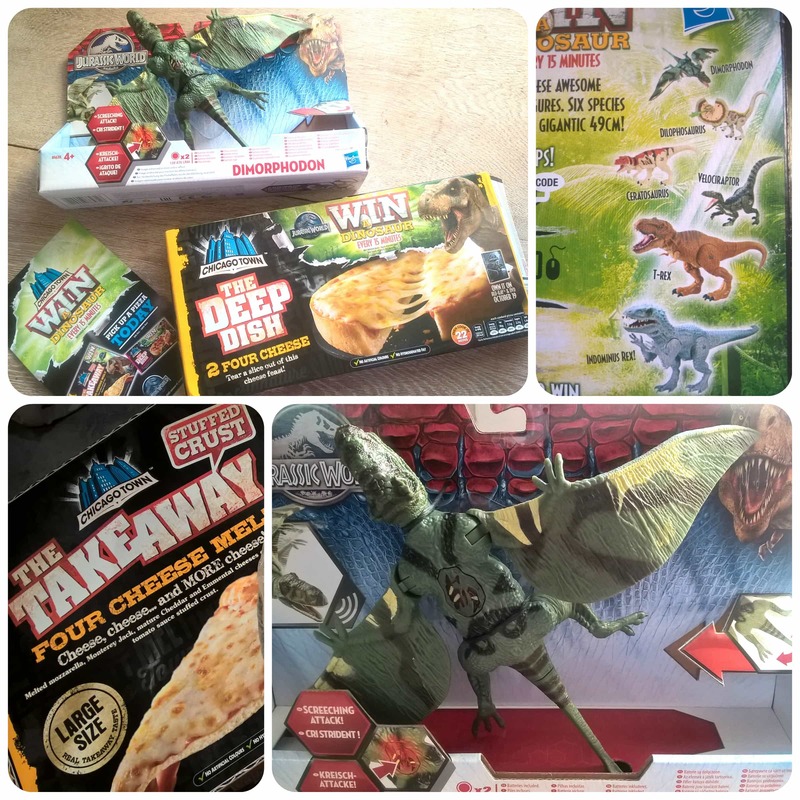 At the moment every time you buy a Chicago Town pizza, you will find a special code on the inside of the box which you can enter online in the hope to win one of six Jurassic World dinosaur toys. Every 15 minutes between 8am and 8pm a different dinosaur is released so you can try your luck to win every dinosaur. It’s definitely worth a try as we won on our third attempt which my son Mister B is very happy about. 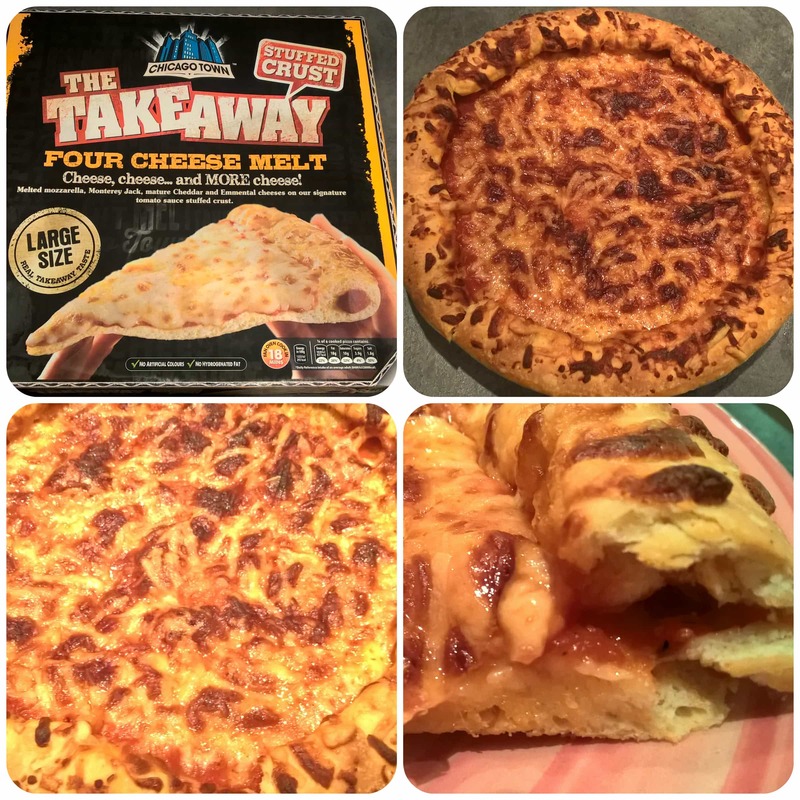 If you are unsure what pizza to buy, then I am going to highly recommend The Takeaway Four Cheese Melt. With a stuffed tomato sauce crust and topped with a combination of Mozzarella, Monterey Jack, mature Cheddar and Emmental cheeses, this pizza is pure heaven. We hadn’t tried this pizza before but got it in for all the family on Saturday night and it disappeared within minutes with everyone saying how delicious it tasted. The crust rose up beautifully to a soft but crispy edge that just melted in the mouth. 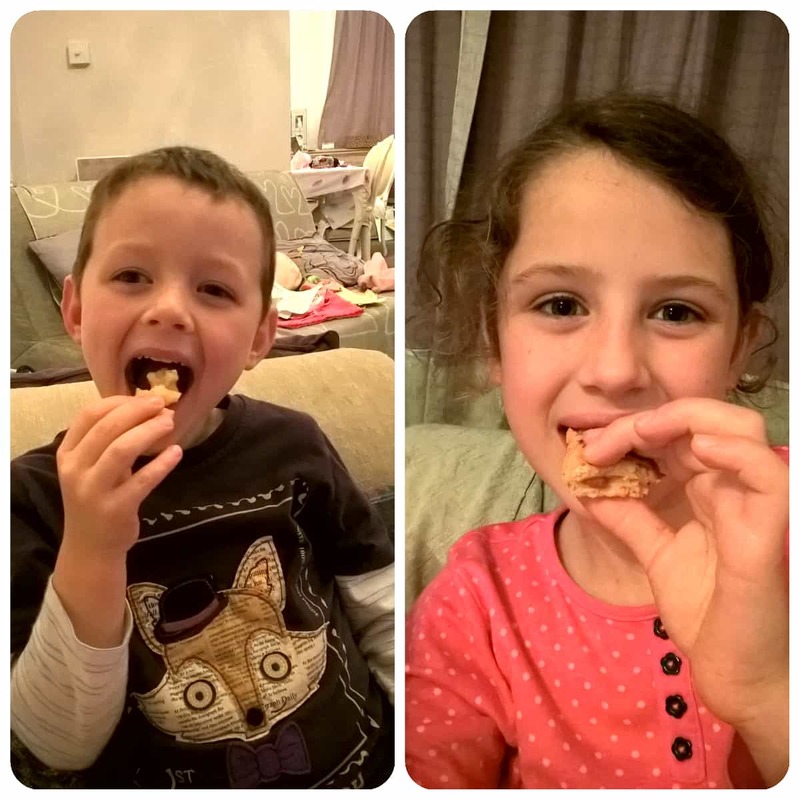 This will definitely be our go to pizza in the future for weekend family treats! All reviews are my own and my family’s opinions and we received a dinosaur and some vouchers in order to write an honest review. Miffy is an absolute classic in this house, a character I’ve loved as long as I remember, and one that my children haved loved from birth with their cudldy Miffy’s, Miffy blankets and such like. 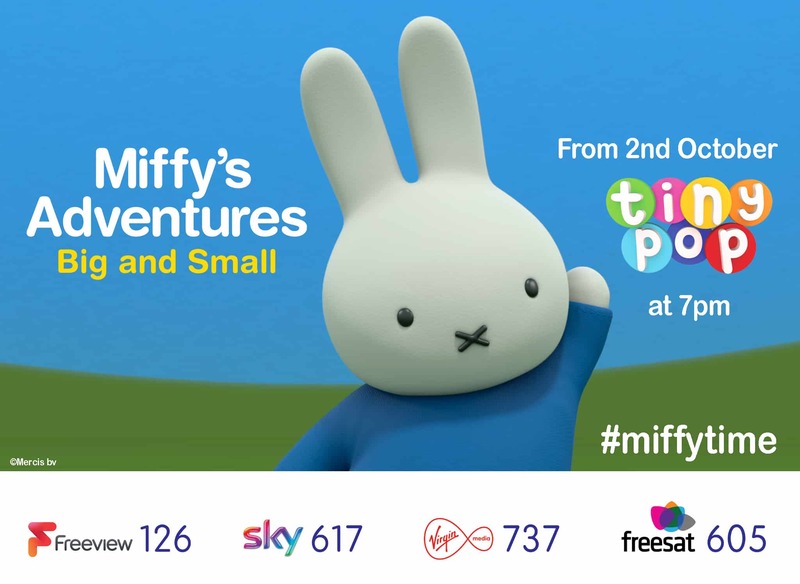 We’ve had a Miffy dvd for the last few years that we watch regularly, but how excited were we to discover a new series of Miffy on one of my children’s favourite tv channels – Tiny POP! On at 7pm each evening you can catch two episodes of Miffy’s Adventures Big and Small. Last night we watched an episode about Miffy playing hide and seek with her dog friend Snuffy. It was a really cute episode and what we like about the programmes are that they are easy to watch, simple to understand and really fun viewing. Accompanied by music the programmes are a pleasure which even I enjoy. With simplistic illlustrations it’s easy to catch up with what’s going on and both my children aged 5 and 7 are glued to it. My children tend to bath, come down in their pyjamas and watch Miffy with a hot chocolate before heading back up to bed for a story and sleep. 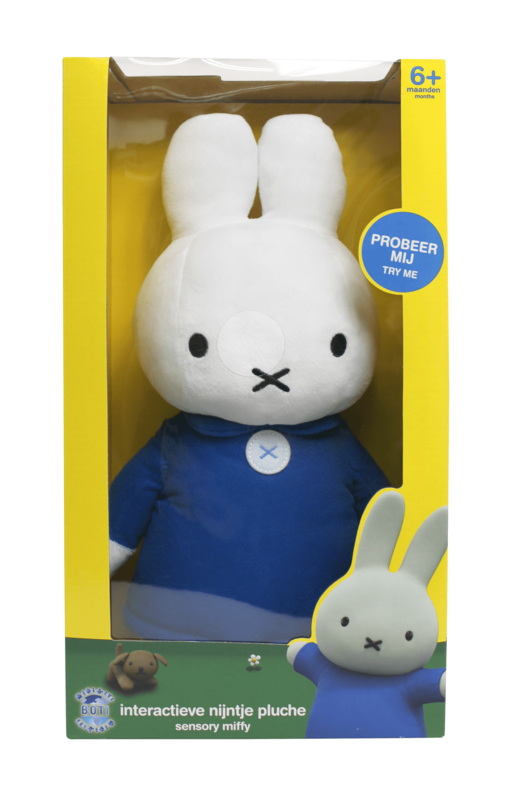 As well as the TV series, there are endless number of Miffy items available, all of which look so cute and appealing, including this fabulous sensory Miffy. I have one of these sensory Miffy toys suitable from 6 months+, to giveaway to one lucky reader!